Review: 2012-11-30, the fight between Lyman Good and Andrey Koreshkov has not been particularly spectacular: two stars. Lyman Good (14-2-0) entered as the No.30 welterweight in the world while the undefeated Andrey Koreshkov (12-0-0) entered as the No.29. 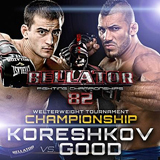 Good vs Koreshkov is the final of the Bellator welterweight tournament; main event of Bellator 82. Watch the video!